The Kingdom Come Superman calmly sips coffee as he explains that he watched the entire JSA die. Starman speaks to Kal, and explains to him that he was in the same universe, Earth-22. This baffles the JSA, who know nothing of the 52 alternative universes. Superman indicates that the JSA broke up and never reformed on his Earth when Magog killed Joker and got away with it. The JSA lock Superman in and confer. Superman listens as they talk nervously. Obsidian appears and tells Superman about the JSA's role and how this society is not like the Kingdom Come society. 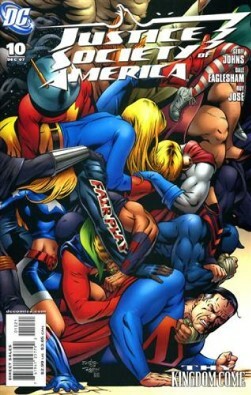 Superman hears a voice, and fights his way through the JSA to get to it. Bursting to speed, he saves a suicidal woman at the last second, telling her that giving up never helped anyone. In the Batcave, Batman muses on the new Superman and looks at his Kryptonite ring. Power Girl kneels at Kal-L's grave. Jay and Wally examine the Cosmic Treadmill. In the sewers, a mysterious force kills Chroma, saying that Chroma was never a God, but he (the attacker) is. 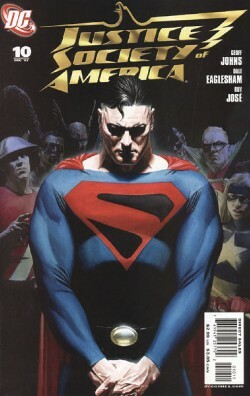 Story - 5: A solid introduction to the Kingdom Come Superman in this universe, rife with character and great scenes. From Superman relating the end of his universe to coming to terms with the potential costs of regret, this story really grabs you and won't let go. One of the better JSA issues I've read. Superman's attempt to flee the JSA headquarters gives you the real feeling that he might be a menace, and yet he goes to save the girl. I think that's a good portion of what this character will bring the JSA. You don't know if he's going to go haywire or if he's going to be a great man, because of all that he's seen. That's the complexity of character that made Kingdom Come so great, and it's a large part of why I wholly encourage this storyline, given that the JSA in this universe is the redemptive team for heroes who need a second chance. I sound like such a broken record reviewing this series, and that's because it's so tight, there's hardly any way to convict it of failure. It's so incredibly good that I even forgot this review. Steve forgot this review. We spaced, and I didn't realize we hadn't done it until today. This is for several reasons. First, when I read a comic, I start immediately seeing what I wouldn't like for the review. I turn my critical eye. This book hardly ever gives me anything. Secondly, every review is so uniformly positive, I thought I'd already done it. That is a damned good book, if it can do that. COMPLETELY silence a critic, particularly one that can be as vehement as I am about stuff. Art - 5: The picture of Superman as he saves the suicidal girl should be on my wall. It's not even a splash, and it should be on my wall. It's that good. Beyond that, the opening, all of the action, and the continuing quality pushes Eaglesham even further into my favorite artist's circle. Add in some Alex Ross pages, and how can you lose? Cover Art - 5: Representative of the issue at hand, beautifully rendered by Alex Ross, and a poster waiting to happen. Again, I sound like a broken record, and again, I can't help it. It's just that good.